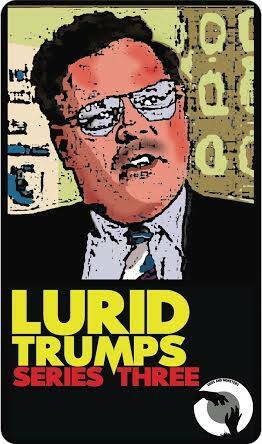 Perhaps you are new to the cut-throat world of Lurid Trumps – in which case, a belated welcome. First, a run-down of the rules of play – deviations from which are discouraged, lest portals to other worlds be opened. “Deal the shuffled cards out equally, face down. 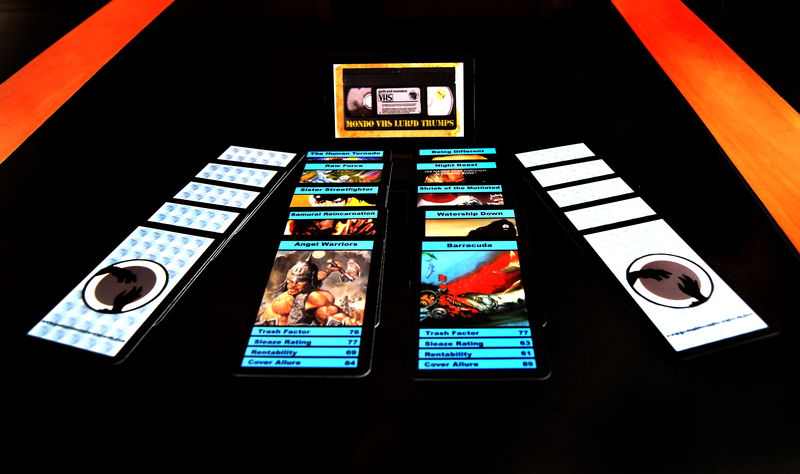 The player on the dealer’s left reads a category and score from their top card. The other players do likewise. 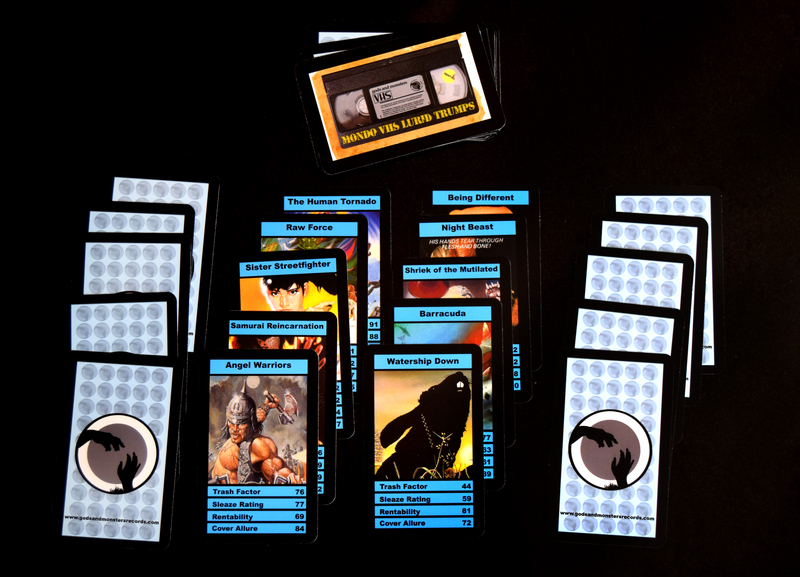 The highest value wins, and the winner takes all the top cards, placing them at the bottom of their stack. 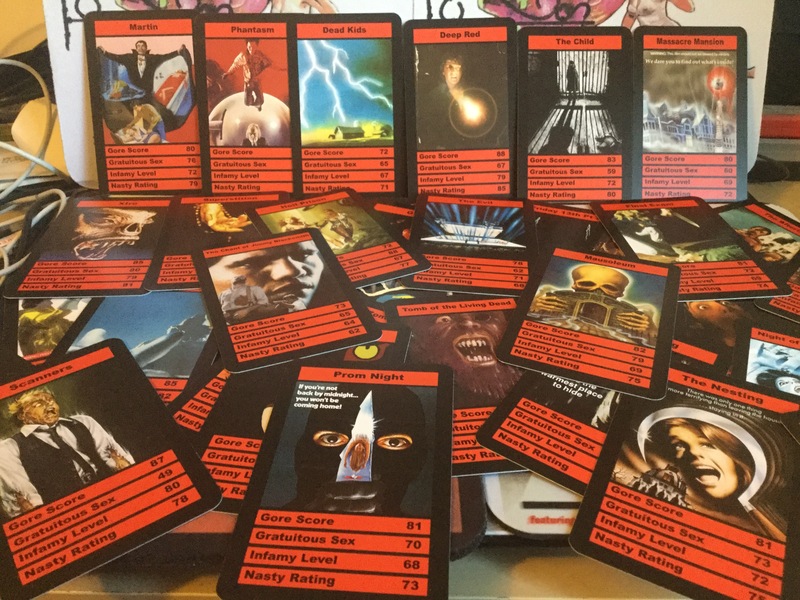 They then choose a category from their top card. If two or more cards share the same selected top value, all the top cards are placed in the middle and the same player chooses again from their next card. The winner takes all the cards in the middle as well. The ultimate winner is the player with all/the most cards. They may then force all the losers to carry out any degrading, illegal or deadly act they wish and will be exempt from legal ramifications under the 1965 Trump Act”. 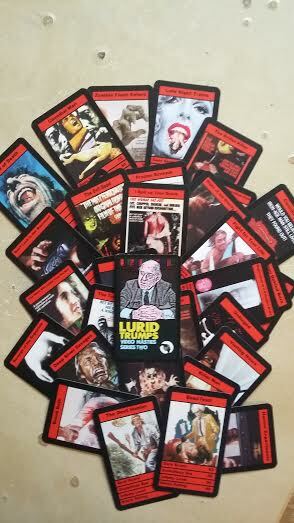 Thus far, there are been three sets of Lurid Trumps, all covering the infamous 72 Video Nasties and the so-called ‘Section Three’ titles. 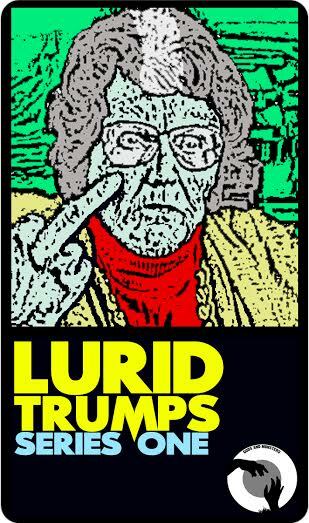 Set One – The Mary Whitehouse edition. 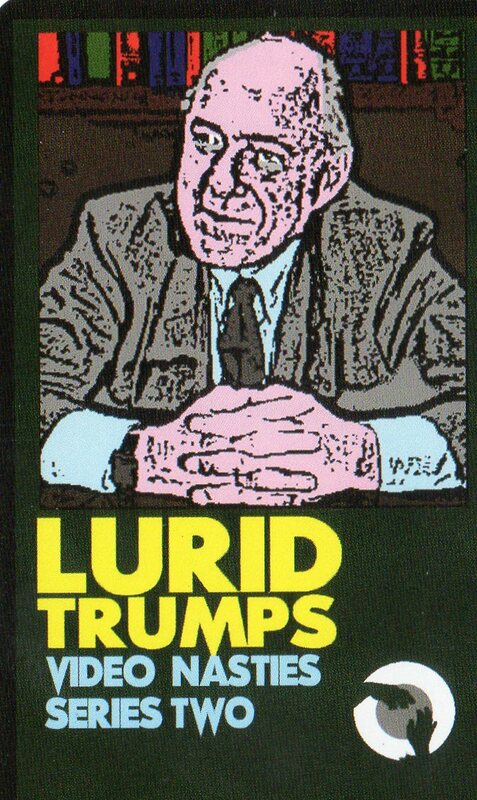 All the nasties sets feature a cover card of a figure from the fun and games of the crackdown on what were hailed as corrupting films in the early 80’s. Mary was the most recognisable figure of censorship in the UK, almost omnipresent on television, warning of the dangers of watching just about anything. This is now sadly very sold out indeed. 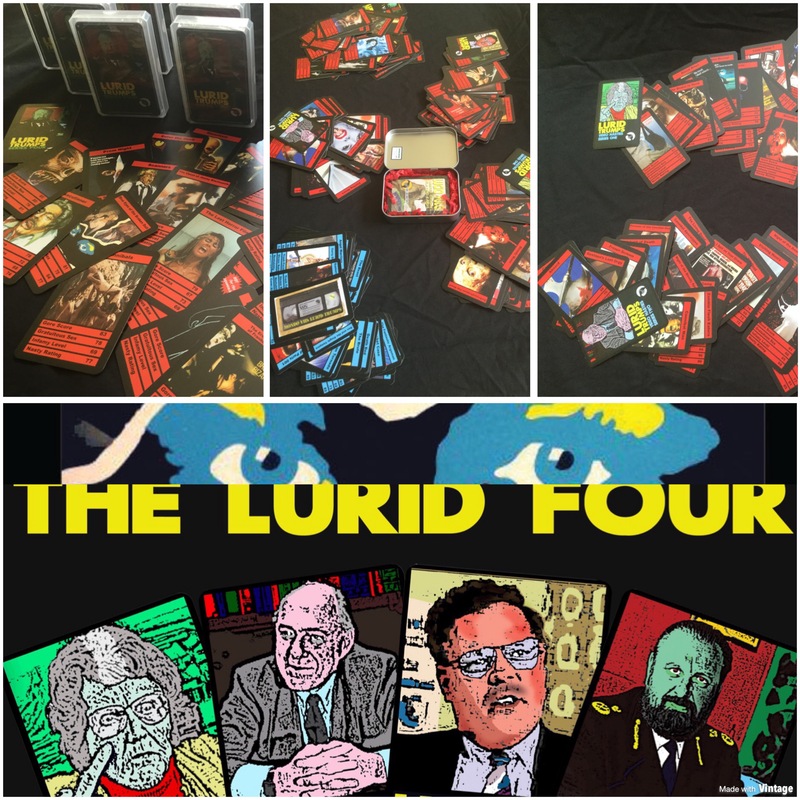 Set Four – The James Anderton Edition. 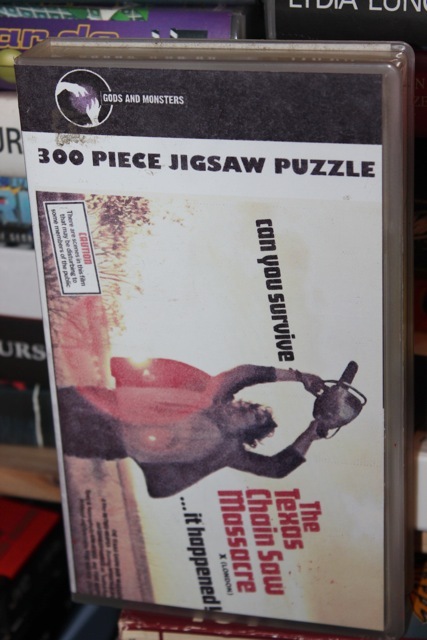 The second set of the so-called Section 3 titles, featuring both obscure titles and those which, unthinkably at the time, now regularly screen on terrestrial and cable television. 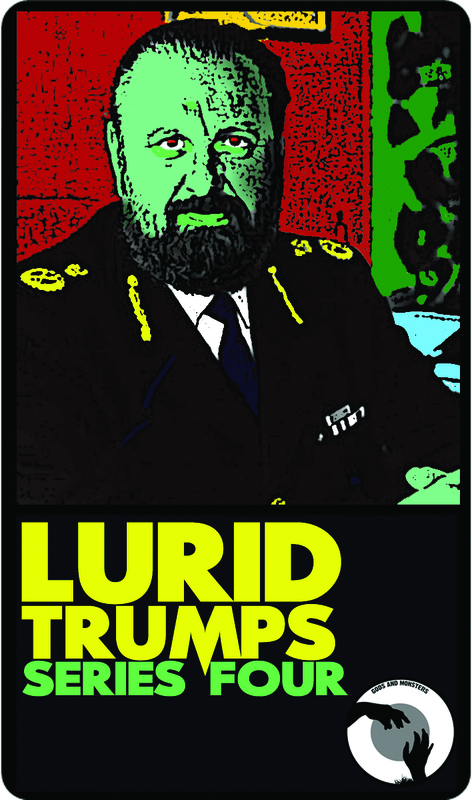 Anderton was chief constable of Manchester during the Video Nasty era and his devout Christianity and position of authority in the judicial system meant he had a platform for regularly ranting against the evils of watching horror films in the home. 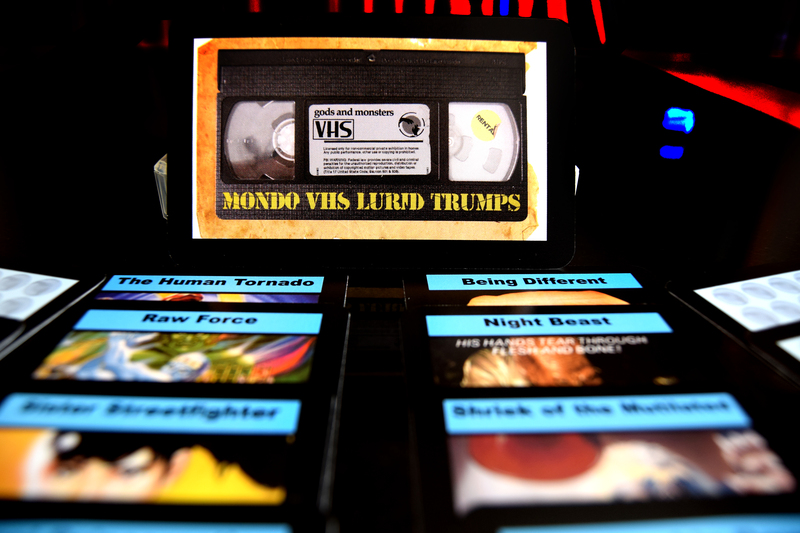 Set Five – Mondo VHS! 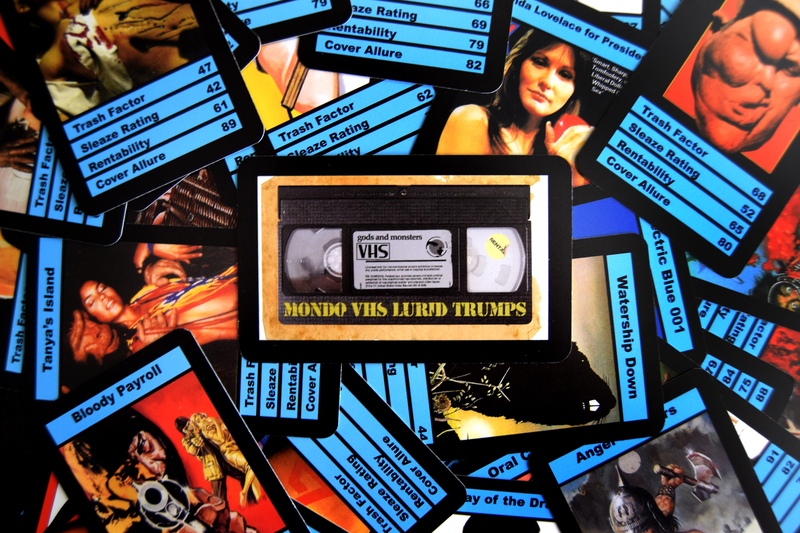 A no-holds barred journey through the pre-certificate videos of the early 1980’s, taking in all possible genres but mostly the gruesome, the salacious and the bizarre. The first of many planned set, available to buy here now! Price Massacre! 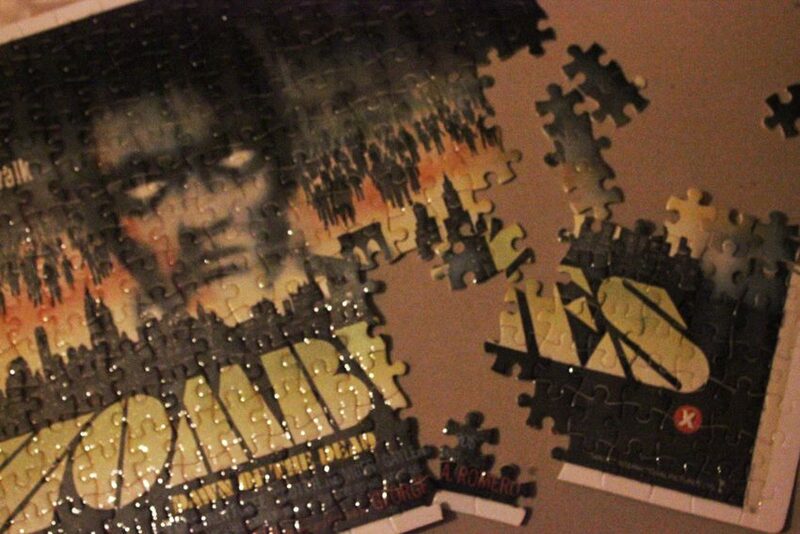 No reprints when they’re gone! 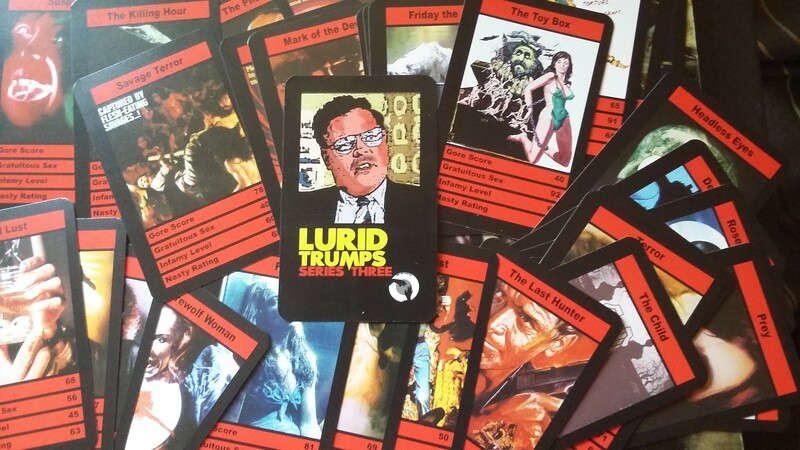 Gods & Monsters are proud to announce the latest addition to their best-selling Lurid Trumps, the card game for the discerning trash fiend and collector. 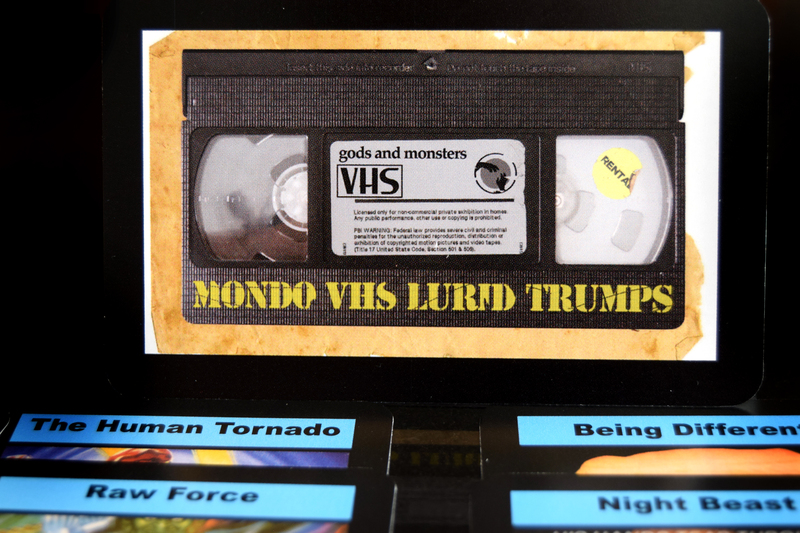 Following on from the rapturously-received four volumes of Video Nasty Lurid Trumps, we can now unveil a new strand – Mondo VHS! 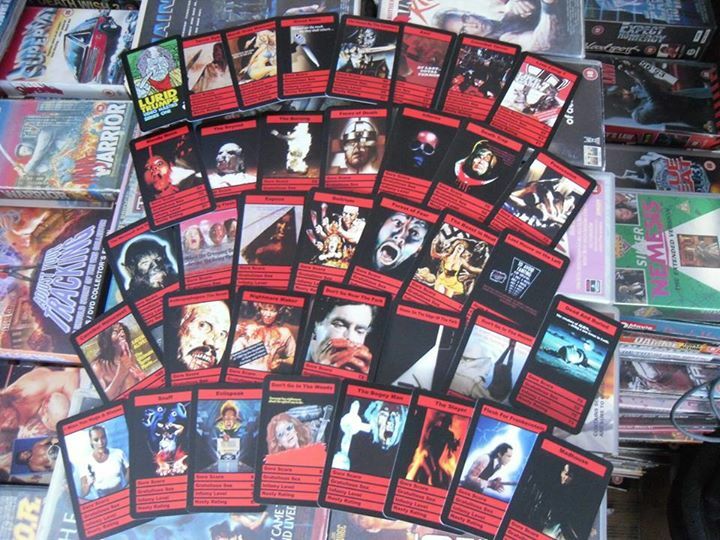 Sucking deep upon the musty video libraries of yore, each card will be adorned with a lurid image of video sleeve art from the glory days of pre-certification. 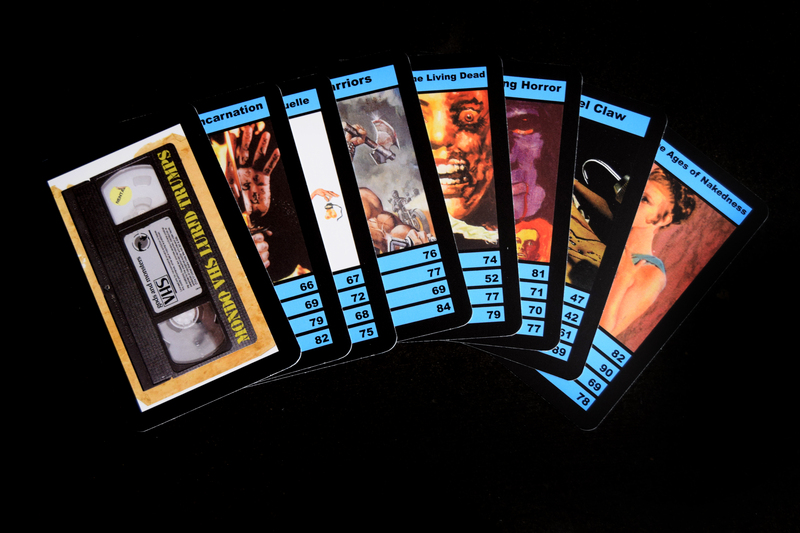 Featuring horror, trash, sleaze and the downright weird, each will be scored by genre experts across four brand new categories: Trash Factor; Sleaze Rating; Rentability and Cover Allure. 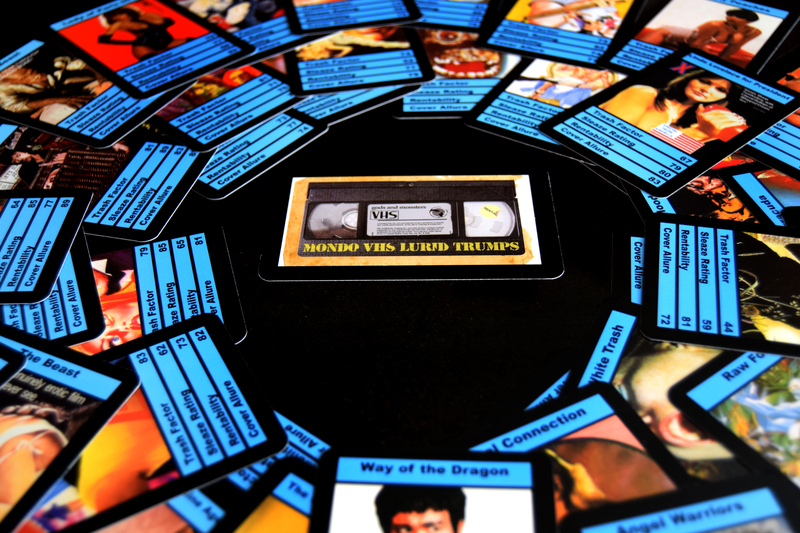 With 40 cards in the set and future volumes in the same line planned, they’re perfect as a stand-alone game or for sprawling week-long sieges for the dedicated trump veteran. 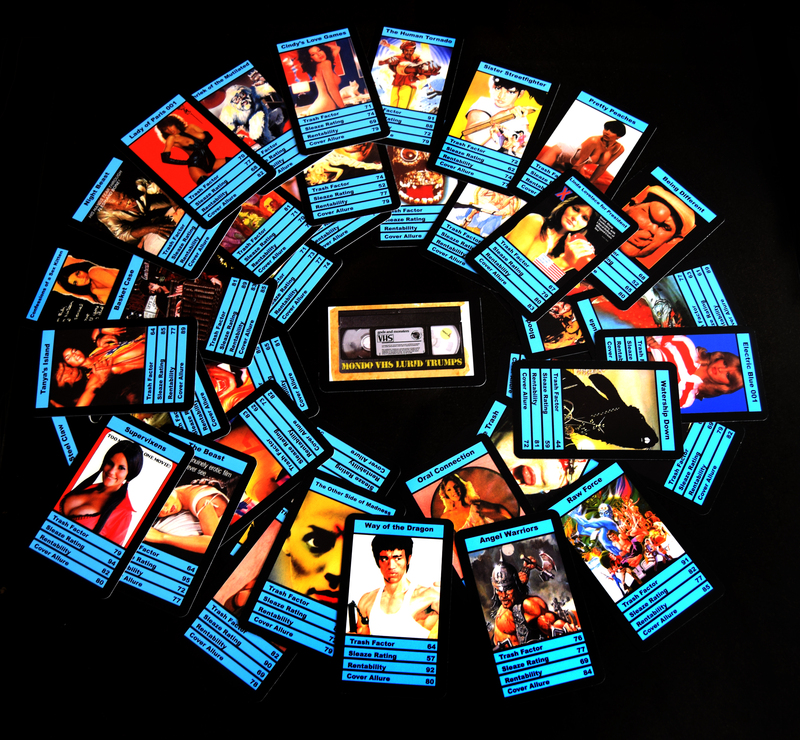 All cards are printed on plastic-coated, professional grade card-stock and come with an exclusive cover-card. Housed in a transparent plastic case for protection and presentation, what better game to play with infirm relatives or in your local tavern? Limited to just 200 sets worldwide, future sets are already planned. 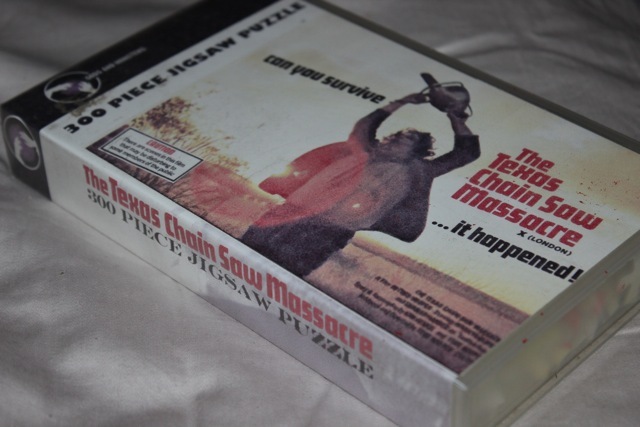 After the huge success of our first jigsaw release, Texas Chain Saw Massacre, we now unleash the follow-up – the instantly recognisable UK quad image of George Romero’s seminal Zombies: Dawn of the Dead. 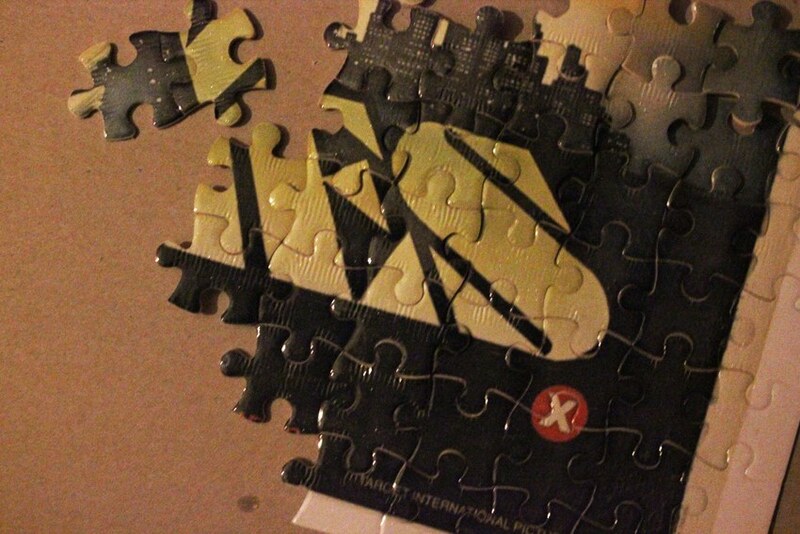 As with its predecessor, it will be printed in hi-def on quality, gloss-effect card, with 300-pieces offering enough of a challenge without prompting you to throw it out of the window in anguished frustration. 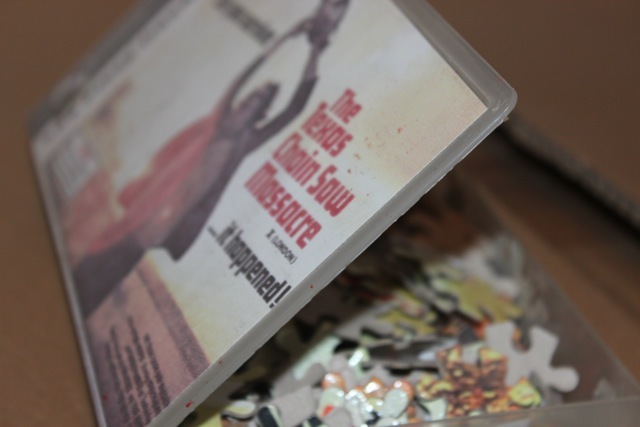 It is housed in a vintage VHS case with a retro-bootleg-type sleeve, to sit nicely amongst your collectibles whilst still being a truly stand-out piece. Long sold out, we have an extremely limited number of store returns we can now sell. We have learned no lessons whatsoever from the first release, so this too is limited to only 50 units worldwide. When it’s gone, it’s gone. Even if you email us and say nice things. They are all individually numbered to make you feel even more special. Make every drink an experience to remember with this Tenafly Viper bottle opener! Featuring the company logo – established 1924, and popularised in famous documentary film STREET TRASH. This handy sized bottle opener is small enough to carry around wherever you go, but sturdy enough for even the toughest of bottles that you might find in a dusty crate. What’s more, it is magnetic, and so can be kept on your fridge door/metal head plate for convenience. Forget the other promo gifts from lesser brewers – this Viper bottle opener is body-meltingly good! 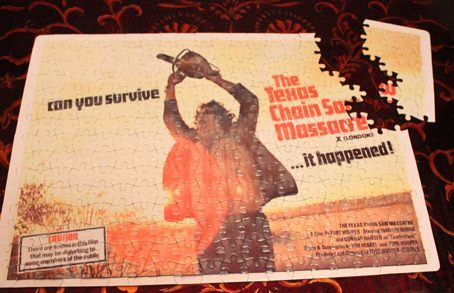 Limited to only 50 units worldwide, our Texas Jigsaw Massacre renders the 1976 London-only quad poster image for one of the greatest horror movies of them all, Texas Chain Saw Massacre, in puzzle form and is sure to delight both fans of the film and those with a passion for interlocking and tessellating. The original run of 50 sold out in 3 days – this is your last chance to buy the store-returns we have now received! 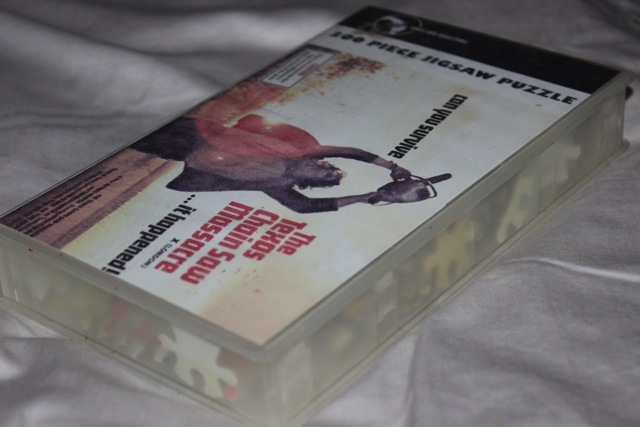 Printed in hi-def on quality, gloss-effect card, each 300-piece jigsaw is housed in a vintage VHS case with a retro-bootleg-type sleeve that will fit nicely on the discerning collector’s shelf. As all the VHS cases will be genuinely ex-rental, they will all be unique and come with the marks and stickers of video shops past.